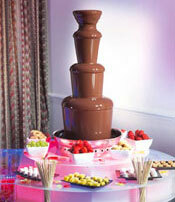 The Chocolate Fountain is ideal for weddings! They are becoming the most sought after addition to the celebrations. Whether you choose to have the fountain instead of a dessert for the wedding breakfast or to accompany an evening buffet, you will not be disappointed. The fast growing craze is to have a Erupting Chocolate Fountain instead of a wedding cake. How many people actually enjoy eating wedding cake? The stunning tiers of warm Belgian chocolate will be a lasting memory of your wedding for both the Bride and Groom as well as the guests. Just imagine the photos, the Bride and Groom dipping strawberries into a White Chocolate Fountain! Whatever your event, whatever the size, our stunning Fountain with its' illuminated 2 tier surround will create a positive and lasting impression on everyone. Whether you are holding an event for your staff or entertaining clients, a Chocolate Fountain will be eye-catching and a great conversation starter. The Fountain looks great at the entrance point to your function where your guests can grab a glass of something cold and a dip of something warm and mouth-watering. Beats Canapes any day!. Or, you could use the Fountain in the main body of your function. We always have a uniformed, professional Operator with the Fountain to ensure the smooth running of the fountain and to replenish the dipping foods. At Chocolate Eruptions we pride ourselves with a first class service from beginning to end. We also hold Public Liability Insurance. One of the most prominent positive influences our Chocolate Fountain will have, is that of the increased interaction between guests. Our fully trained and uniformed attendants will attend to all aspects of the Fountain ensuring all guests enjoy themselves, whilst indulging in the ultimate pleasurable dessert experience. A Chocolate Fountain is ideal for all parties and celebrations from Birthday and Engagement Parties to Retirement and Anniversary Parties. 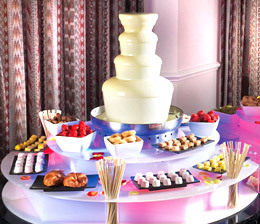 The Chocolate Fountain makes an impressive centre piece or a gorgeous dessert along side your buffet. Our medium and large Fountains come with an impressive two tier illuminated base and an Operator to attend to the Fountain, leaving you to enjoy your Party! *We want your occasion to be a memorable one so if you have a special requirement that is not on the dip list, then let us know and we will try our best to obtain it. As long as it is suitable for dipping. that stands at 48 inches tall for just �40.00 extra. 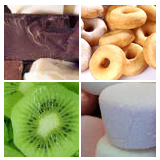 All contents of this Web Site are copyright � 2006 Chocolate Eruptions All rights reserved. Our 0844 phone number call costs are �0.05 pence per minute plus any network extras from a BT Landline. Calls from other networks and mobiles may vary and may cost more according to the terms of your service provider.